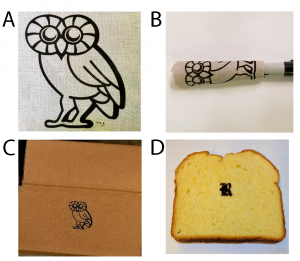 Using lasers to make graphene on the surface of food! Featured image: Adapted from Chyan, Y.; Ye, R.; Li, Y.; Singh, S. P.; Arnusch, C. J.; Tour, J. M. ACS Nano 2018¸12 (3), 2176-2183. Copyright 2018 American Chemical Society. One of the really exciting things about Chemistry (and other sciences!) is the development of new compounds and structures that have interesting and unexpected properties. In the past few years, it would be hard to find a material written about more than graphene. When described, it almost seems like it is straight out of an episode of The Jetsons: transparent and flexible, electrically conductive, and stronger than any material else ever tested. It’s only one atom thick and made entirely of carbon, the same element that makes life possible. But since it was first discovered, graphene has had a hard time leaving the lab and moving into real-life applications. Part of this is because it has to be made from specific chemicals and inside precise atmospheres. However, these researchers have developed a way to create graphene on the surface of nearly any carbon-based object, like cloth, paper, and even bread! The structure of graphene is a single layer of carbon atoms, arranged in repeating hexagons (like the surface of a soccer ball, but flat) (Figure 1A). When these are stacked on top of each other, the more commonly known graphite is made (Figure 1B). In fact, graphene was first made by using Scotch tape to lift off layers from a chunk of graphite! But now, graphene is more usually made from smaller, carbon-rich chemicals that combine together to make graphene. One of these ways uses repeated blasts from lasers to heat the material, driving off other elements and giving the remaining carbon atoms enough energy to rearrange into graphene. Previously, researchers have used a polymer called Kapton (a polyimide) as the carbon source. But this means that any surface that you want to make graphene on has to be coated with Kapton first, which may not be possible for all materials. 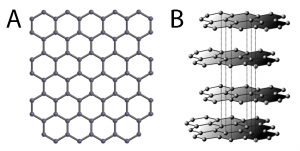 Figure 1: (A) Graphene sheet made from carbon atoms (grey balls) (B) Graphite is multiple sheets of graphene stacked on top of each other. Adapted from “Graphene” and “Graphene-graphite relation,” licensed under CC 2.5. These researchers developed a way around this by changing how the laser hits the surface. They started with materials like potatoes and coconut shells, which have a high concentration of the molecule lignin on the surface. Lignin is a polymer that makes up the cell walls of many plants that have tough bark. By using a lower laser power than with the Kapton methods, the surface of the plant was first charred, turning into amorphous carbon (carbon without any overall structure). After this, more hits with the laser converted this carbon layer into graphene (Figure 2A)! They proved this by testing the graphene on the coconut shell with Raman spectroscopy, which measures how the atoms in a chemical structure can stretch and move. The peaks labeled “G” and “2D” show the way the carbon atoms vibrate side-to-side inside of the flat graphene sheet (Figure 2B). Because they are strong, sharp peaks, this means that graphene was made! The “D” peak means that the graphene has some defects, either missing atoms or bends, so it isn’t perfect. But it still works well enough for the applications the researchers have in mind. 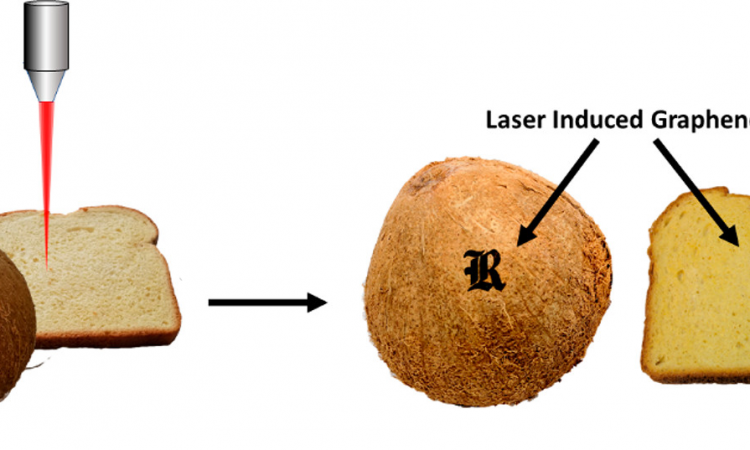 Figure 2: (A) Laser-induced graphene “R” on a coconut shell. (B) Raman spectrum of coconut shell graphene. The “G” and “2D” peaks indicate graphene, while the “D” peak indicates defects. Adapted from Chyan, Y.; Ye, R.; Li, Y.; Singh, S. P.; Arnusch, C. J.; Tour, J. M. ACS Nano 2018¸12 (3), 2176-2183. Copyright 2018 American Chemical Society. After this, the researchers started fine-tuning the laser blasts use to make the graphene. They found that by moving the sample out of focus of the laser, they could hit one part of the sample multiple times in the same scan (Figure 3). Because a laser is just high-intensity light, it is can be (and usually is) focused on the surface of the sample in the smallest point possible, so it is the most powerful and controllable. 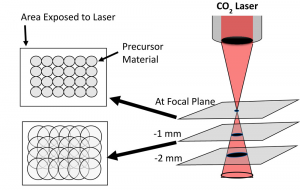 Defocusing the laser made it so the carbon-source material could be converted to amorphous carbon, then graphene in one scan over an area, since each point gets hit by the laser multiple times. This means that the process is much faster and doesn’t need as much precision with aiming the laser for multiple passes. Figure 3: Moving the sample below the focal plane of the laser defocuses the laser spot and lets each part of the sample be exposed to the laser multiple times in a single scan. Adapted from Chyan, Y.; Ye, R.; Li, Y.; Singh, S. P.; Arnusch, C. J.; Tour, J. M. ACS Nano 2018¸12 (3), 2176-2183. Copyright 2018 American Chemical Society. With this, the researcher decided to try making graphene on materials that were more sensitive than the tough lignin on the coconut shells. But first they had a small problem to solve. Many of the materials that might be interesting to put graphene on are made out of cotton (i.e. cellulose). When heated, cellulose doesn’t char and become amorphous carbon, like lignin. Instead, it burns! The molecules break down into lighter compounds that become gasses and leave the surface of the material. To fix this, the researchers coated the cotton-based materials in a fire-retardant (designed to prevent burning), so that they would char into amorphous carbon, which could be turned into graphene. After doing this, they could convert nearly any cellulose-based material into graphene! This included flexible cloth, cardboard, and even bread (Figure 4)! Figure 4: Laser-induced graphene on materials treated with fire retardant. (A) Muslin cloth, (B) Muslin cloth wrapped around marker. (C) Cardboard box. (D) Bread. Adapted from Chyan, Y.; Ye, R.; Li, Y.; Singh, S. P.; Arnusch, C. J.; Tour, J. M. ACS Nano 2018¸12 (3), 2176-2183. Copyright 2018 American Chemical Society. The ability to put graphene on the surface of such a wide range of materials opens up huge possibilities. Imagine having circuitry built into the fabric of your clothing! Or cheap medical testing kits “printed” on a small piece of paper! Although graphene still has a long way to go before such applications are available, this new method of making it helps pave the path. One day in the future, you could even walk out of the store with a graphene-based label build right into your fresh food!